OWoN: This is shameful, inhumane and utterly disgraceful for mass murder on such a scale. 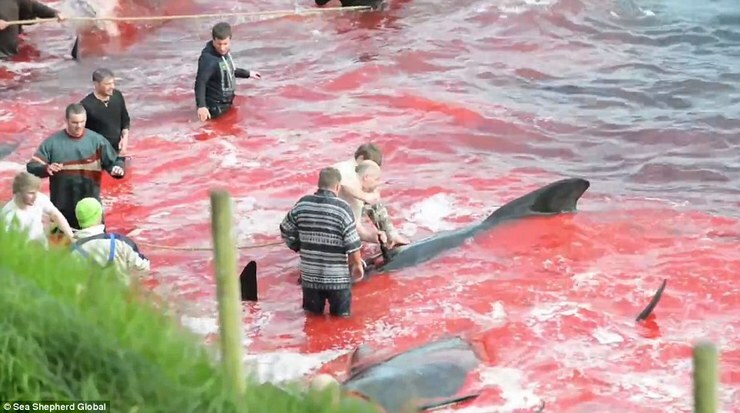 Norway is shamed by this appalling genocide and deserves worldwide condemnation. 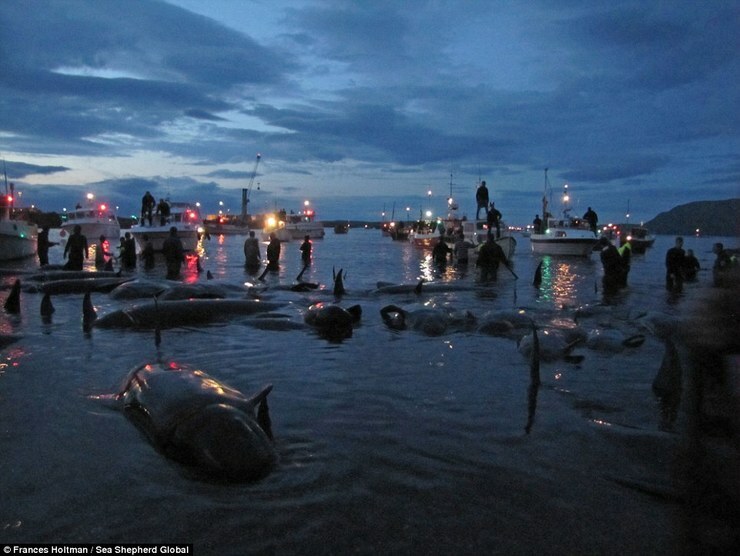 Their bodies lie beached on the dark shore, large slash marks penetrate the neck and sides of the whale as the blood mixes with the cold water. 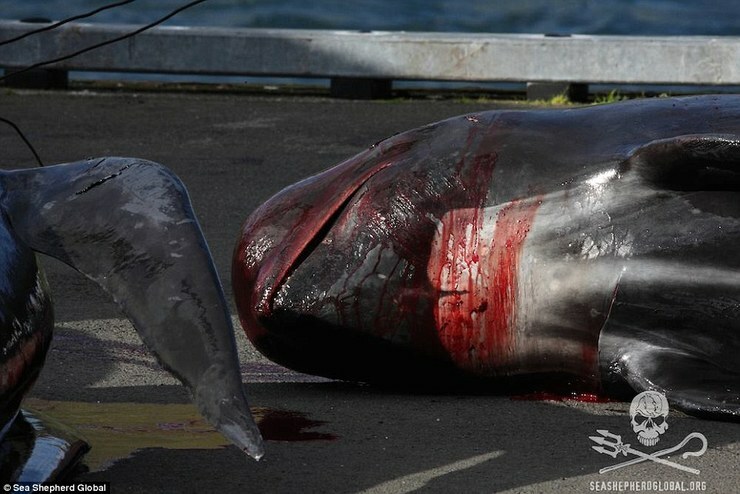 Known as the grindadráp, the brutal slaughtering of pilots whales in the Danish owned Faroe Islands took place yesterday. 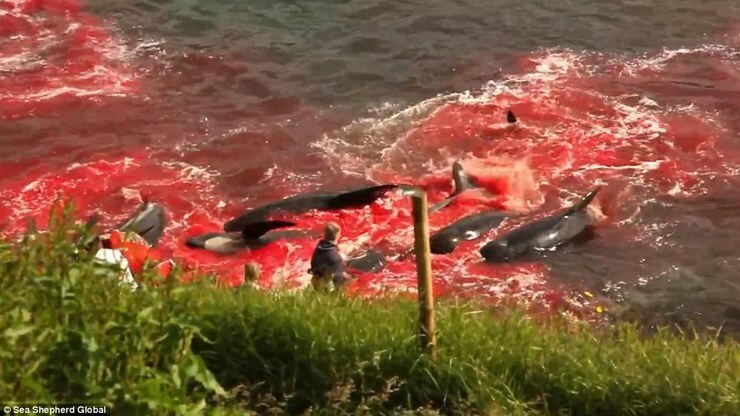 As many as 250 whales were reportedly massacred on two beaches in Bøur and Tórshavn as locals used harpoons and knifes to hack the all of the pilot whales to death. 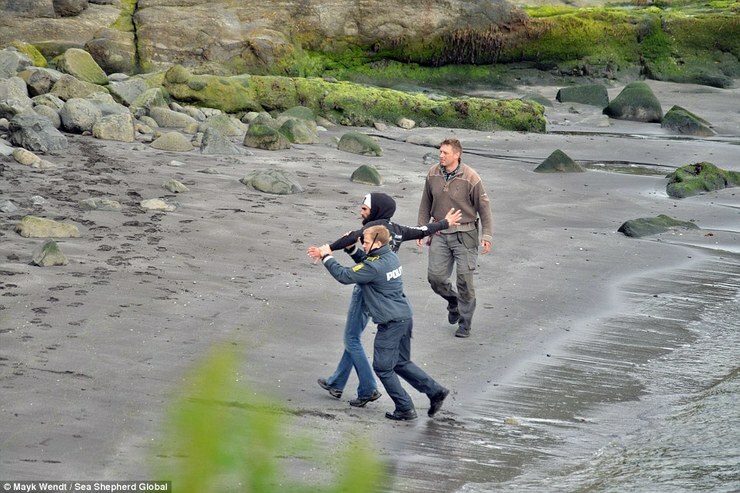 The horrific scenes were filmed by activists from Sea Shepherd, a non-profit, marine wildlife conservation organisation. 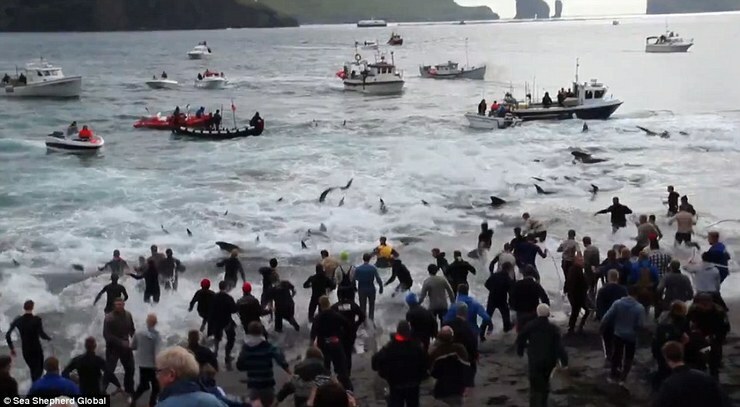 As the innocent whales are forced to swim towards the beaches, the locals begin to run down from the jetty towards the sea. 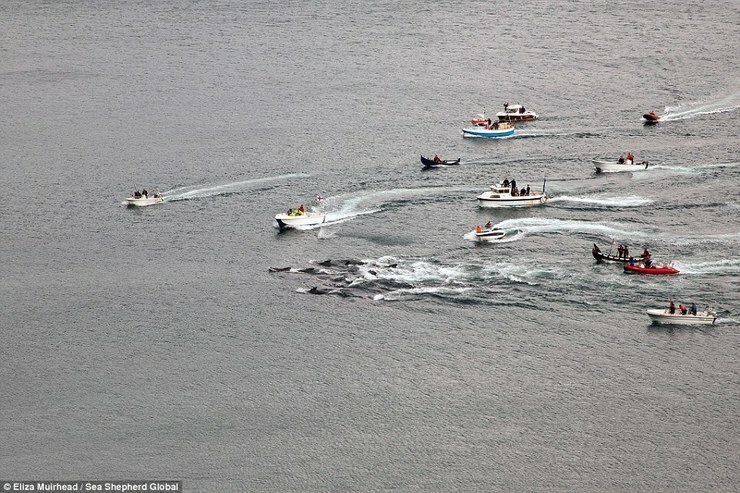 Realising they are unable to escape, the whales slow down as the fishermen in their power boats and dinghies begin to close in on the large school of whales. Using an array of weapons, including sharp knives and harpoons, the locals begin to hack at the animals, slicing at their fatty necks and puncturing their sides. 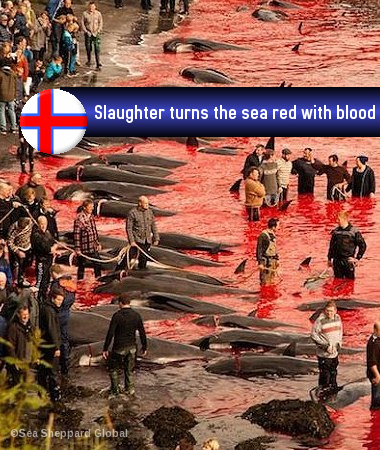 The water quickly begins to turn red with all the blood as one by one, the whales are ruthlessly slaughtered by the heartless locals. 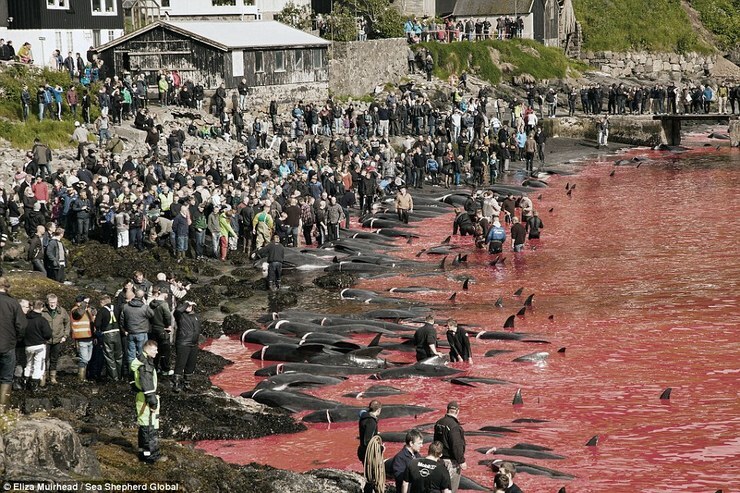 Each year, this horrendous event is carried out across the archipelago of the Faroes Island. 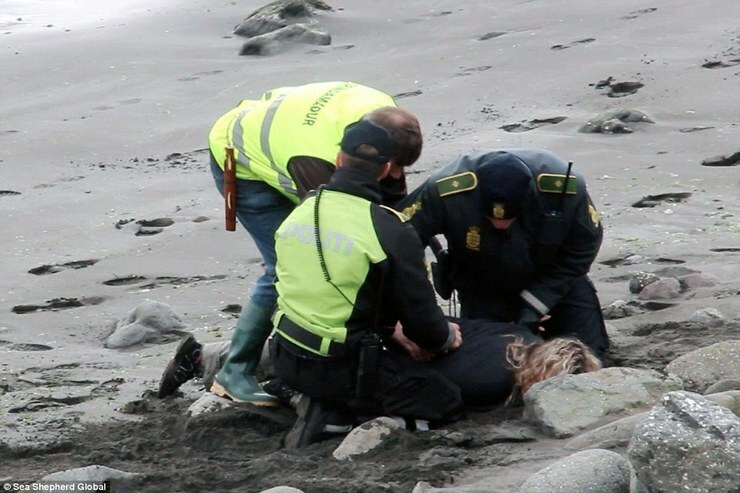 Five activists from Sea Shepherd were arrested after attempting to disrupt the hunt. Wyanda Lublink, captain of the Brigitte Bardot told Sea Shepherd activists that he believed two Danish naval vessels, HDMS Triton and HDMS Knud Rasmussen were in Bøur when the hunt took place. 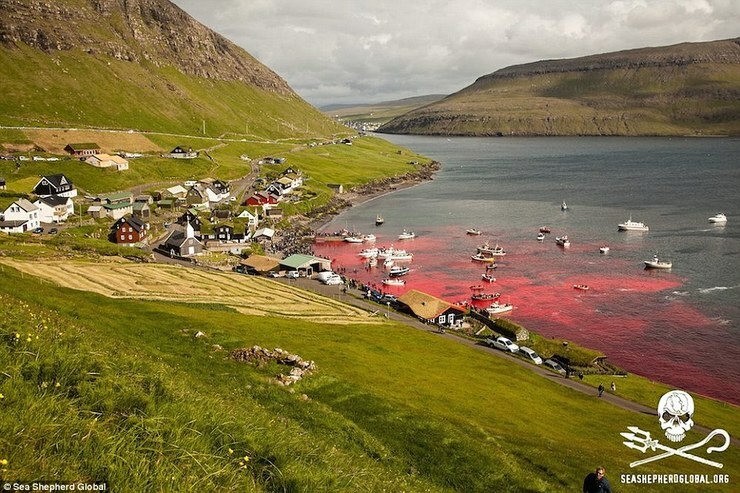 Captain Lublink said: 'It was perfectly clear to me that the Danish Navy was present at Bøur to guard the grindadráp, and that the slaughter would proceed with the full consent of the Danish Navy. 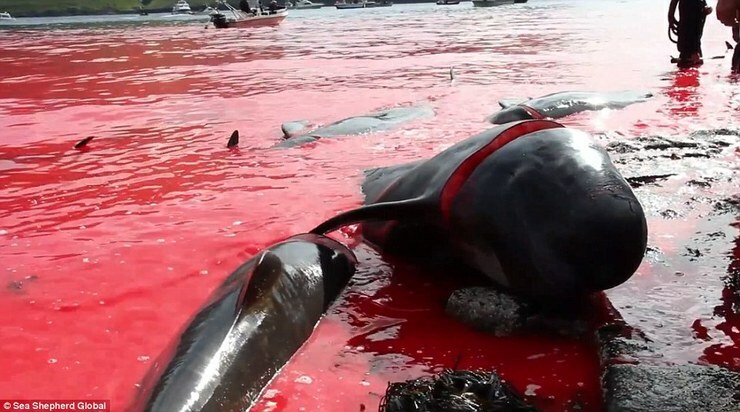 'How Denmark - an anti-whaling member nation of the European Union, subject to laws prohibiting the slaughter of cetaceans – can attempt to justify its collaboration in this slaughter is incomprehensible' he said. 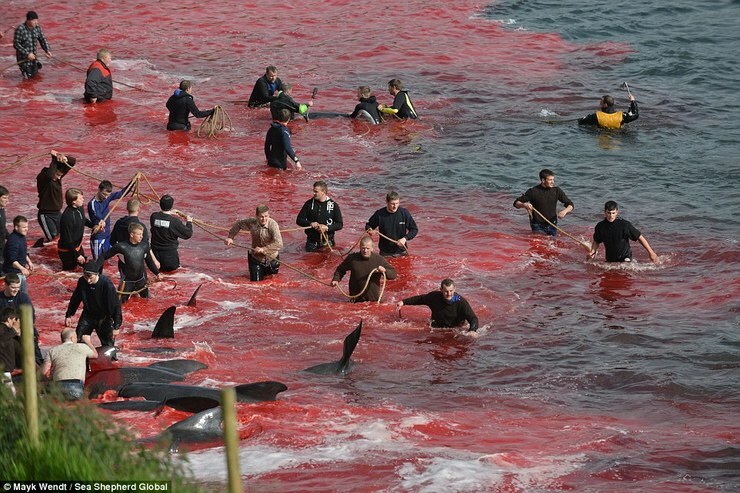 Whilst the pilot whale may not be endangered, the level of brutality and depraved violence is shocking. 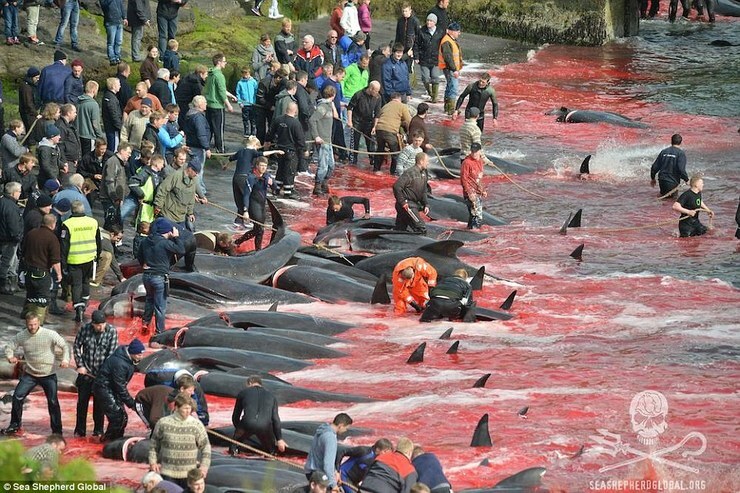 The Faroese have been carrying out the annual hunt for hundreds of years, and although whaling is illegal in Denmark, it is allowed in the Faroe Islands. 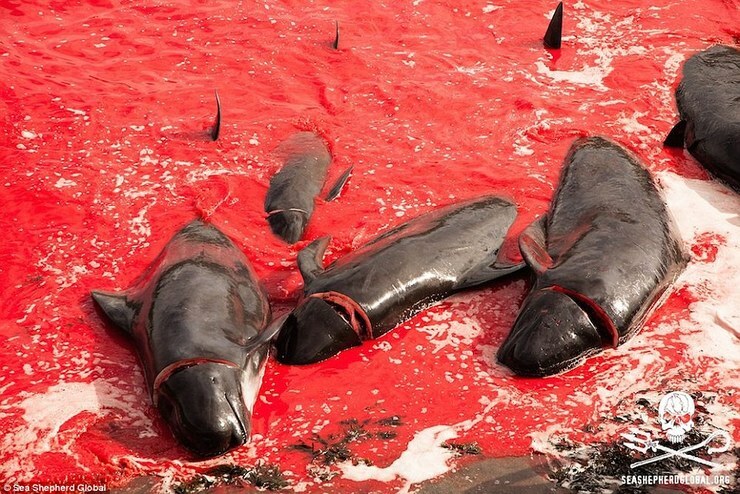 All the hunted whales are used for their food, with pilot whale meat and flubber being the main products used by the Faroese. This is absolutely disgusting. Makes me want to cry. Now Norway is a villain for something which has been done for hundreds of years? 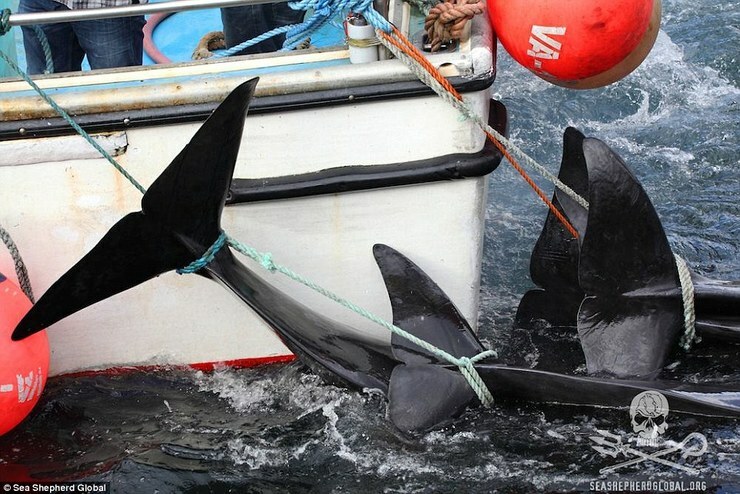 The article clearly states the pilot whale is not an endangered species, and this is done in a very controlled method only once yearly and all is eaten as food. I am not condoning this, yet I am not seeing this as even being anything close to being "genocide". Yes, HUMAN are carnivorous creatures! What humane method should we use to put meat on our plates? People just don't think about how that nice juicy steak they buy at the grocery store actually got there. Are the cattle, chicken, turkey industry to be villains? 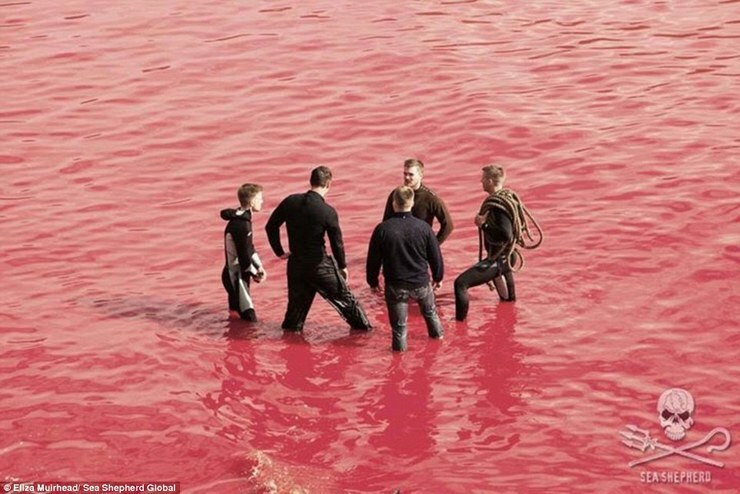 These images are so graphic and seem grotesque because it shows the mammals blood staining the waters of the bay. How many millions of gallons of cattle blood is spilled yearly? This is not about greed or cruelty, but a simple fact that we are carnivores. Many aspects of human reality are quite sad, and is duly noted with this testament to what we are. This made me cry, too. For the whales, and also for us humans.... ~darylluke. Difficult to realize what most of us are...carnivores. But you make good points DL. Not endangered, and a contolled kill. Not pleasant, but same as any killing for meat. Ok, at the risk of being forever cast into the abyss, how about some balance here. DL is correct. We are Omnivorous, we eat meat. I worked for 20 years in an export meat processing establishment. What do we say about the huntsman in the wilderness who hunts game for food? A bear, a deer, a cute furry rabbit? Do we not have it drilled into us all that we are a product of random evolution. How then does God get dragged into the equation to defend His creatures? Come on! This is a community which gathers together once a year to harvest an essential food source essential for their existence. How about some info on the community? Exactly how essential is this harvest for their survival? It is unpleasant, absolutely, but seriously! Balance it out folks. 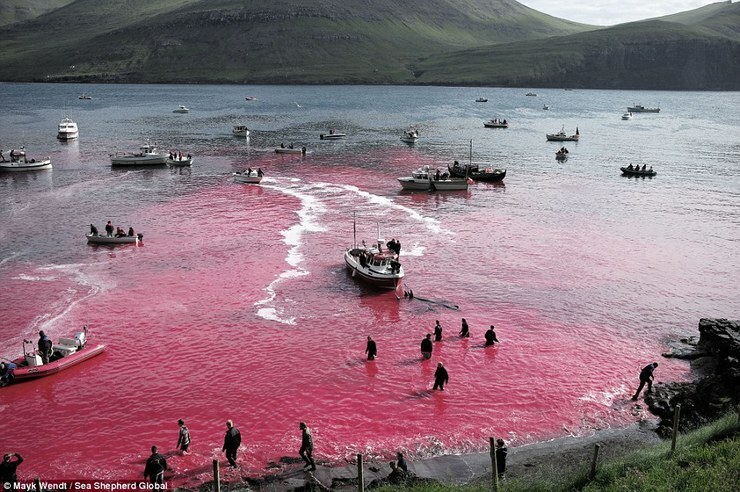 Fishing is the single most important industry in the Faroe Islands, followed by tourism and wool production. More than 97% of the islands' exports consist of fish produce. Part of Tom Brown, Jr. training when he was a boy under tutelage by a very old Apache shaman was to track, stalk, hunt, attack and kill a fully grown adult male deer with just a knife. I forget which of the books that account was in. But, reading that account gave me a whole new look on this world we live in today. The sacredness of life has been lost to societies. As ever and always the aboriginals had it right. The spirit of the dead deer was honored and every piece of his body used in thankfulness and silent respect & reverence. I for one was changed for the rest of my life when I read that account. Yes, we must become the greater beast to prey upon another for our sustenance, but honor and respect and gratitude was given after.This last part is missed completely in today's world, except MAYBE those who speak a prayer before meals. Why did we genocide and exterminate such wonderful peoples worldwide? It breaks my heart to this very day when I think of that. There was a period in my life for literally perhaps 2 years I cried for all the tribes killed so mercilessly daily. In my secret loneliness I cried for them all. Yes,it is true, we can be lonely, quite lonely when surrounded by people..... ~darylluke. I think the point is being missed here. It is the sheer brutality of which this is done. You can't compare this to a hunter in the wild unless that hunter jumped on the back of a deer and viciously stabbed it to death. Killing humanely is one thing, brutally massacring is another. I am in agreement that the methods used are archaic and not for the squeamish. I have 9 years experience as a govt meat processing inspector and auditor. An essential component of my work was to ensure all animals were instantly rendered insensitive to pain and enforce strict adherence to ethical, humane standards. Years ago this was not the case and we have progressed a long way in developed countries in the humane treatment of animals for human consumption. If this 'harvest' were to continue, what I would have thought appropriate in this case, with the technology available today, is some way of instantly rendering the fish insensitive to pain and distress, in line with international humane protocol. As I have no expertise in fish processing I cannot offer a suggestion as to how that could be achieved. 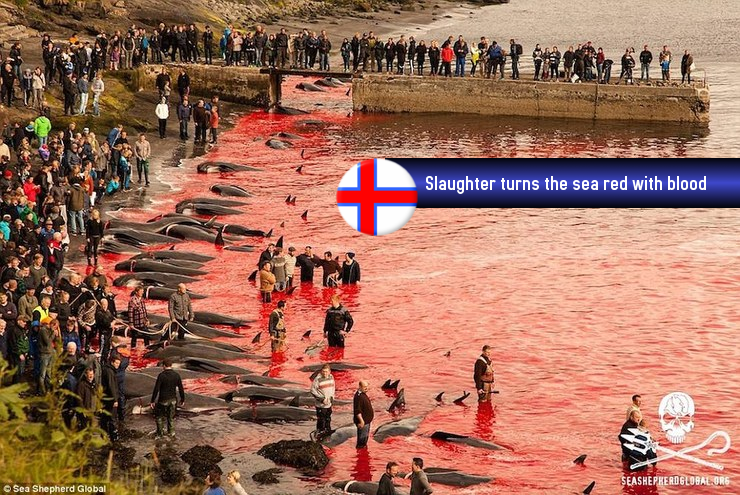 If they have not already done so, perhaps the author(s) of the article could contact the appropriate people and use their energy to lobby for humane standards to be adopted in the Faroe Islands. In my opinion, this article portraying a group of frenzied madmen gleefully and randomly hacking and butchering poor innocent fish to death with murderous and barbaric intent is exaggerated, inaccurate and unhelpful. The barbarity of it today is startling but from what i read...this is an age old custom.....it probably wasn't very pretty seeing natives in loincloths do this age old custom one hundred years ago, if it goes that far back. However, we have video of aborted viable children torn apart for choice and greed everyday.....much more barbaric. You have to go back to Mengele to match that level of barbarity.